Steve writes: Is there a setting in Facebook where I can keep “Most Recent” stories as default instead of “Top Stories” in News Feed? Hi Steve! So yes—by default, the first stories that appear in your news feed are so-called “Top Stories,” or those stories that Facebook (using its own secret sauce) thinks will be the most important to you. Now, there is a way to switch the order of news feed to “Most Recent”—that is, a chronological list of stories posted by your Facebook friends, untouched by Facebook’s arcane “Top Stories” algorithm—but the setting isn’t permanent. On the iOS and Android apps for Facebook, tap the three-line “More” button in the corner of the screen, scroll down and tap Most Recent. All well and good…but the next time you open Facebook on the web or on your phone, your news feed will revert right back to the “Top Stories” view. 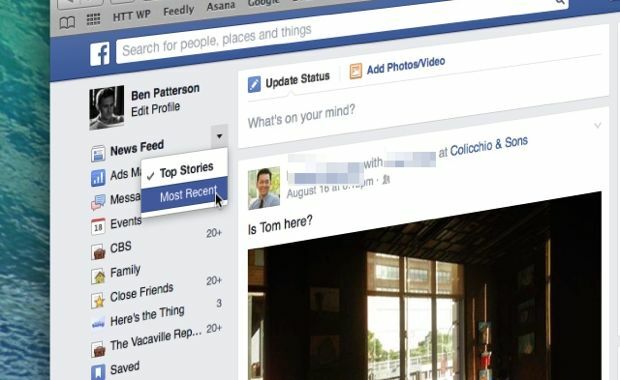 So, what if you do want your news feed to stick with the “Top Stories” settings? Unfortunately, there’s no way to do it on the Facebook mobile apps (or at least, none that I know of), but there’s a workaround with the web version of Facebook. The trick: adding a special Facebook bookmark to your favorite browser. That little bit of extra code at the end of the link tells Facebook to sort your news feed in chronological (or “chr”) order. Now, here’s the thing about bookmarking this tweaked Facebook URL: while it’ll definitely force your news feed to default to “Most Recent” on your initial visit, your feed may revert to sorting by “Top Stories” as you continue to browse. Yep, pretty annoying, but at least you can snap back to chronological sorting by clicking your custom Facebook bookmark again. Hope that helps, Steve. Still have questions? Let me know! Facebook starts grouping news feed items by topic: Like, or dislike?